Definition at line 53 of file mean_collision_data.h. Definition at line 56 of file mean_collision_data.h. Definition at line 60 of file mean_collision_data.h. Definition at line 69 of file mean_collision_data.h. Definition at line 99 of file mean_collision_data.h. 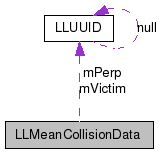 Referenced by LLFloaterBump::add(), LLMeanCollisionData(), and mean_name_callback(). Definition at line 100 of file mean_collision_data.h. Definition at line 98 of file mean_collision_data.h. Definition at line 95 of file mean_collision_data.h. Referenced by LLFloaterBump::add(), mean_name_callback(), and process_mean_collision_alert_message(). Definition at line 96 of file mean_collision_data.h. Referenced by LLFloaterBump::add(), and process_mean_collision_alert_message(). Definition at line 97 of file mean_collision_data.h. Definition at line 94 of file mean_collision_data.h.